This year I decided to try & integrate Khan Academy (KA) into my Math classes. This semester I have 2 sections of grade 10 applied math. Past experience has shown me that many of these students come in with significant skill gaps & little to no willingness to do any homework. On the 2nd day of school I took my classes to the computer lab & had them all sign up for KA accounts & add me as their “coach”. KA does an assessment of what the student knows when they sign up by having them answer a variety of questions. After which it tailors the practice problems to their level. I can also recommend practice problem sets as their coach, which my students will see at the top of their list of exercises to work on. I am out of the classroom a lot. This semester I am teaching at the University of Ottawa each Monday (and therefore not in my high-school classroom each Monday), a member of the digital learner’s advisory panel which will meet a few times throughout the year, a mentor to a new teacher for which there are meetings & workshops to attend, … the list goes on. I am often away for 2 of the 5 school days in a week. Now when I am planning for the supply teachers, I more often than not book us a computer lab, mobile cart of chromebooks, or set of iPads and TA-DAAAAA; lesson planned! 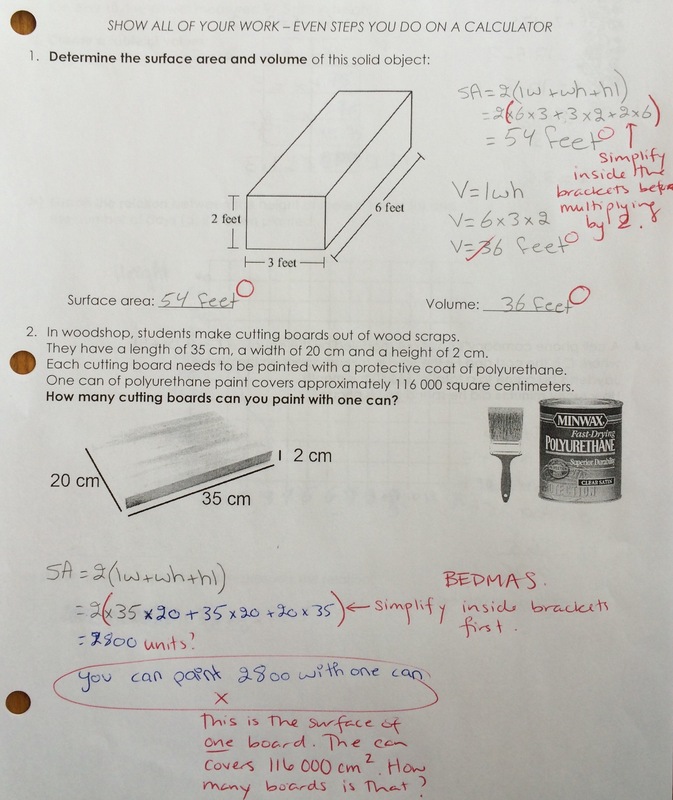 Students work on the recommended problem sets and the supply teacher can help students as needed. Applied students are not into doing homework for the most part. But some will ask for extra work or problems to do at home. KA to the rescue. I have recommended that each student spends 20 minutes per night on KA doing practice problems. There is no consequence for not doing so, but we’ve talked about why it is beneficial to do so. I can also see how much time each student has spent doing problems via my coach’s “dashboard”. I can also recommend a problem set to my class (it pushes it out to their accounts) if I want them to practice something specific after the day’s activities. I spent much of this past weekend marking tests. One of my students was having difficulty using the surface area formula, in part because they weren’t following “order of operations” when simplifying the expression after substituting the appropriate values: With KA I was able to suggest a problem set on “order of operations” for this one student only. The student will see it at the top of their list of exercises the next time they log in. This is useful because order of operations is not grade 10 curriculum, so I do not need to suggest it to all of my students in that class. Differentiation: Each student works on what they need to work on (according to both my & KA’s assessments) – which may be skills that they should have learned before grade 10 math. Coach’s recommendations: I can recommend exercises to students based on what we’ve done in class, or a skill I’ve noticed them struggling with. Immediate right/wrong feedback: It tells them right away if they have the right or wrong answer. Hints & videos: If students are stuck, they can see hints of the next step to take or watch a video of how to solve similar problems. Too many fractions: KA puts fractions (and not easy ones like 1/2 or 1/4, but 8/3 type fractions) into exercises for solving equations. My students are panicked by these complicated fractions, aren’t sure how to work with them, and often give up when they see them. Irrational numbers expressed as square roots: My applied students haven’t learned how to work with a number like 5√2. Because KA uses these in even their simplest trig practice problem sets, I can’t use them with my students. Display on cell phones: The practice problems don’t always display nicely on a cell phone. Although it’s better if you hold your phone in landscape mode. And some graphics where you have to play with the graph by dragging things around don’t work well on smartphones either. This means I need to have some iPads handy if the students are working on these types of problems. How do you use Khan Academy in your classroom? Let me know in the comments below! This entry was posted in Assessment & Evaluation, Pedagogical Practice and tagged Khan Academy, Technology by mslwheeler. Bookmark the permalink.